This is a book that I seldom consult and have only made a couple of recipes from. It is difficult to analyse why I don’t use the book more often because, on the surface, it appears to be a reasonably well-designed book, with a selection of authentic Italian recipes that have been adapted for the home cook that are nicely presented and photographed and with some parts that are pleasing to look at However, there are several elements of the design of the book that I actively dislike: the designer has used a lot of Helvetica extended which immediately provokes a negative reaction in me; I am not a great fan of extended typefaces - Helvetica extended, to my mind, always appears a bit ‘cheesy’. Aside from issues of my own personal taste, analysing the design further yields other problems: the major one is that there are too many styles and weights of Helvetica. 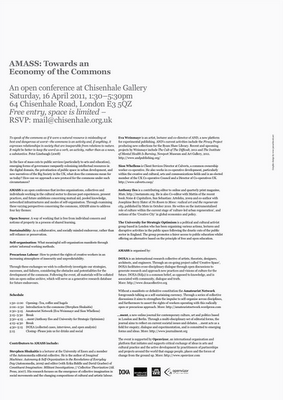 I think that the design would communicate more clearly and would be more cohesive with less styles and weights - the effect would be calmer and the eye would be able to settle on the page, aiding the reading experience. In addition, if fewer styles, weights and sizes were used and with more discretion, i.e. to add emphasis, this would help the reader navigate the different kinds of information on the page, as it is, the hierarchy of the different types of information is confusing. There are some basic issues of legibility: Helvetica extended light has been used for the lists of ingredients and for the running heads; this is not an easy typeface to read, with tight tracking it becomes even more difficult. Taste is a difficult issue; the things that appear ‘wrong’ in this book are largely due to what I perceive as good or bad design. 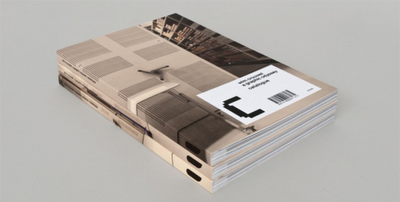 Legibility is an issue and there are parts of this book which are difficult - but not impossible - to read. I have tried hard to analyse this book in a neutral way, without any preconceived ideas, but it’s hard to dismiss your own personal taste in the same way as it is difficult to look at a title in isolation - your reading is always informed by what you already know and what you have already seen. The cover is divided exactly in two: the top half contains a photograph; the lower half features the title and author of the book. The photograph shows courgettes, complete with flowers, in a woven basket. The basket is placed on a rough wooden surface which could be a table, bench or floor. The lighting suggests that the photograph has been taken outdoors, under some kind of shade, with bright sunlight dappling on to the courgettes and wooden boards. 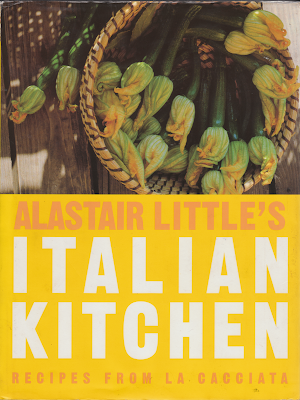 The courgettes, the rustic basket and the strong sunlight signify the Mediterranean and, with the title of the book, lead the viewer to believe that the photograph has been shot in Italy. The title of the book is reversed out, in white, of a warm, sunny yellow box with the author’s name set above in a pale terracotta and the subtitle of the book set below. All are set in a condensed sans-serif, possibly Impact. 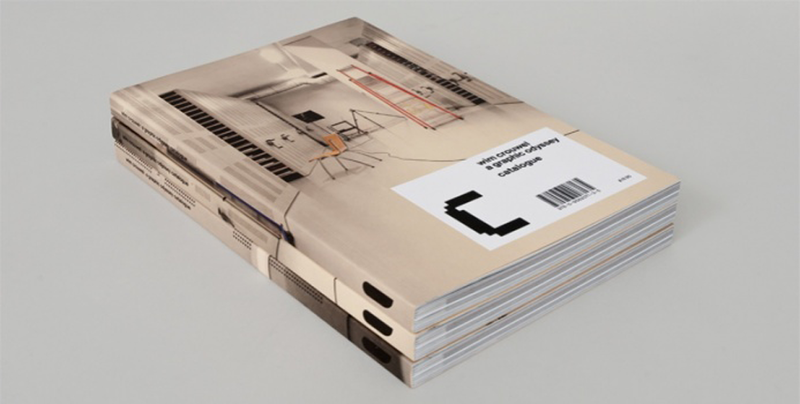 The hierarchy of the cover is shared equally between text and image. Within the panel of text the author’s name and the title of the book have equal billing; despite the title of the book being set almost three times larger than the author’s name, it recedes and appears less dominant because of the minimal contrast of white against yellow. It is difficult to look at the typography on the cover of this book without thinking of the design of the highly successful The River Café Cook Book - published (by the same publisher) two years before, in 1994 - which uses a similar arrangement of type. 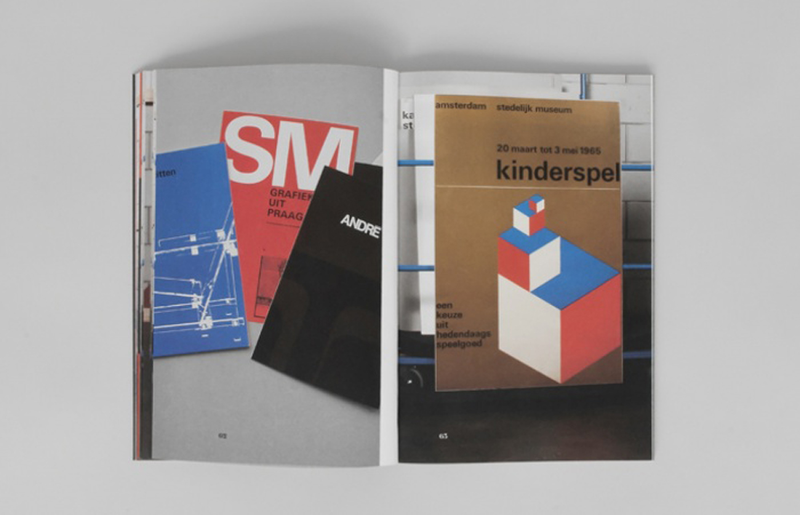 Books are not designed in isolation and commercial publishers will often rework a successful design formula knowing that customers browsing in bookshops are more likely to purchase a book that creates a sense of recognition and familiarity. 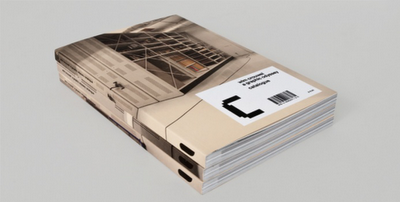 The book is 19 cm by 25 cm, printed full colour on off-white matt coated paper. The layout is based on a two-column grid; the left-hand column is narrow and the right-hand wider with equal inside and outside margins and asymmetrical facing pages. 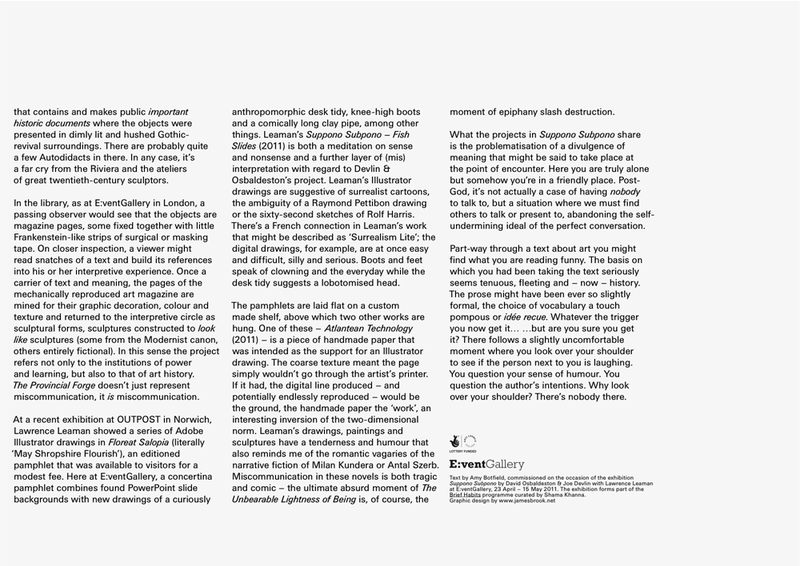 The book has been designed with a confusing typographic hierarchy that uses different weights, sizes and styles of Helvetica to order the various kinds of information in the book: titles are bold and extended; the author’s commentary is set in medium, ranged left and extends across the width of the grid; the ingredients are set in light extended across the width of the narrow column; the method is set in regular, ranged left across the width of the wider column; in addition, there are ‘Little Tips’, snippets of useful information for the cook,which are set in medium extended. Above each tip, the words ‘Little’ and ‘Tips’ are set in light and bold at 50% black, respectively, the two words are also underlined. The effect is confusing and somewhat disorientating: the most dominant element on the page are the ‘Little Tips’ which draw the reader’s eye away from the main body of information. The book is divided into sections, each dealing with a kind of food; Antipasti, Zuppe e Minestroni, Pasta, Gnocchi e Crespelle etc. Each section opens with a double-page spread: on the verso is a large numeral, representing the chapter number, set in Helvetica light extended and placed in the centre of the page; on the recto, the title of the chapter, set in Helvetica light extended, positioned centrally, is reversed out of a coloured page, one colour for each chapter. These spreads function as breathing spaces in the book, acting as a kind of punctuation, a full stop that causes the viewer to pause for a moment. From a typographic perspective, these pages are one of the more pleasing parts of the book; it is nice to see the numerals at a large sizes but, I wonder what these double-page spreads, with minimal information, signify to the general reader - they could, perhaps, be perceived as an indulgence on the part of the designer. Photography is used throughout the book to illustrate the finished dishes and, occasionally, in a more diagrammatic manner to demonstrate techniques. 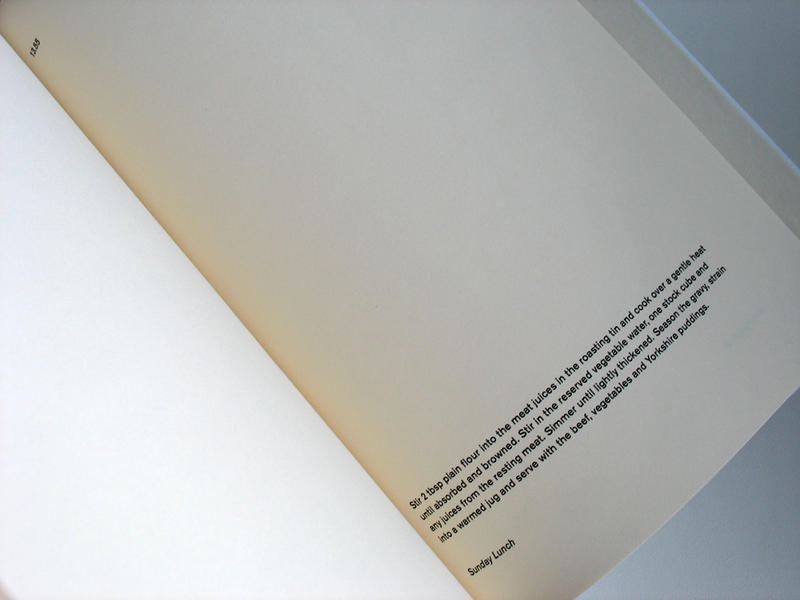 Photographs are usually shown full bleed and generally appear on the recto; there are occasional double-page spreads. The food is shown close-up with the camera at a very low angle; a variety of serving dishes, cooking pots and crockery is used throughout, these are photographed on a variety of surfaces - gingham cloths, rough linen and wooden chopping boards, signifying relaxed and casual dining. Unlike the cover photograph which establishes the idea of al fresco Mediterranean living, the photographs inside the book appear to be interior shots that suggest domesticity. Surprisingly, there are no Italian signifiers, the photography with its vivid reds and greens, lets the food, which takes centre stage, do the talking. This book has been in print for over 40 years and it is easy to understand why. The recipes are easy to follow, having been designed for cooking in the confines of a bedsitter but, to some extent, they are also aspirational: the author’s acknowledgement of the god-like Elizabeth David and references to less commonplace ingredients suggests that although the cooking facilities may be basic, the bedsit dweller can aim for something more sophisticated. 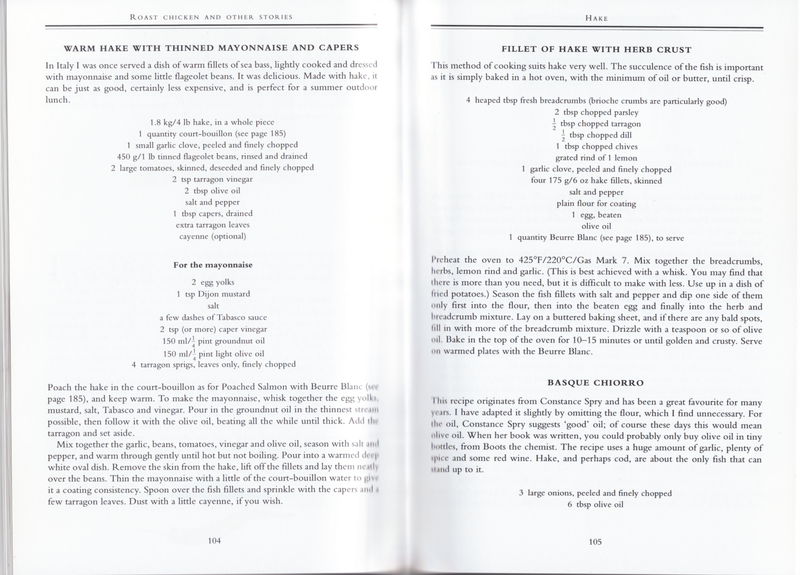 The typography is simple and systematic and helps the reader navigate the contents; it also suggests authority with its neo-Classical centred stylings, engendering trust in the reader that the recipes will work. 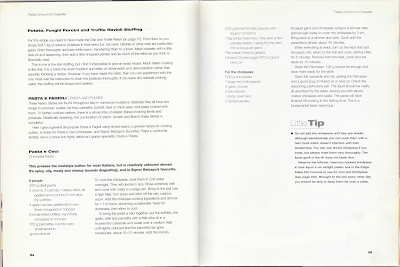 The occasional use of italics - for recipe titles and chapter headings - creates a contrasting conversational tone that stops the more formal typographic elements becoming too overbearing. I am not sure what the interior of this book looks like in the current edition: I hope that it retains the well-considered typography of the 1963 edition: the formality of the typography is sometimes at odds with the informal tone of Whitehorn’s prose but, to contemporary readers, this creates an enjoyable tension which makes the book seems as irreverent, anarchic and proto-feminist as it did when it was originally published. The cover has a full-bleed photograph of a Victorian bedstead made of black painted iron with a polished brass bedknob and rail. 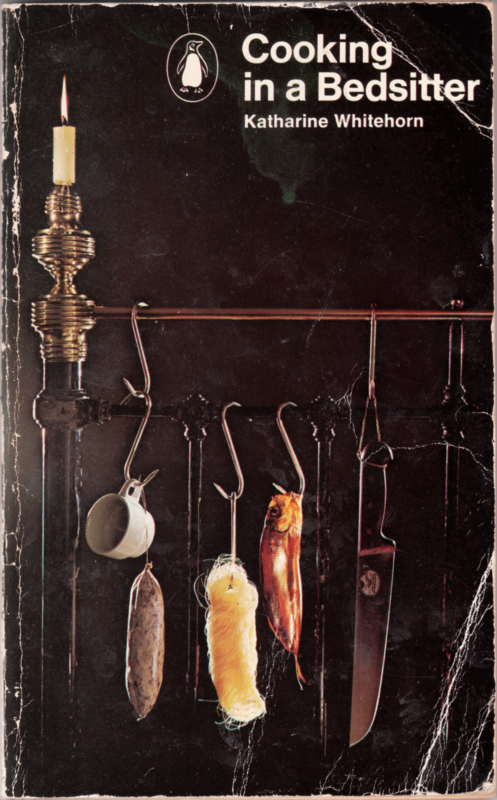 From the brass rail, on hooks normally found in butcher’s shops, hang a small white coffee cup; a large knife; an artisan sausage; angel hair pasta; and a kipper. A lit white candle is stuck on the point of the bedknob. The juxtaposition of items normally found in the kitchen with a bedstead, signifies the idea of a bedsitter and cooking in one room, the room that you also sleep in . The old-fashioned bedstead signifies the faded and aged furniture of the bedsit. The photograph has a romantic, nostalgic atmosphere but, in the 1960s when this book was written and in the 1970s when the photograph was taken, Victoriana was viewed in a less favourable light than the present day, signifying old-fashioned ideas and uptight morality. This carefully-composed still-life is photographed against a brown-black background: the objects are precisely lit with a raking light that comes from the left-hand side of the image, emerging from the gloom like sparkling jewels. Through the careful use of studio lighting, the photograph subtly suggests a room without actually picturing it. The over-riding effect of the photograph is of romanticised squalor: the reality of sharing a bed with a kipper and a sharp knife would be very different from the aestheticised image on the cover of the book. It is interesting that the current edition of the book revisits the original 1960s cover illustration which also features a Victorian bedstead where a couple share a meal amongst pots and pans and a gas burner; this original illustration has a more light-hearted tone and atmosphere than the photograph on the 1979 edition shown above, though both are whimsical in their own ways and use a similar economy of means to suggest the bedsitter. The title of the book and the author's name is set in a titlecase sans-serif typeface, which could be Helvetica or possibly Intertype Standard, a version of Akzidenz Grotesk, which had been introduced by Romek Marber as part of the rationalistaion of Penguin covers in 1961. The title and author’s name are ranged left in the upper right-hand corner. 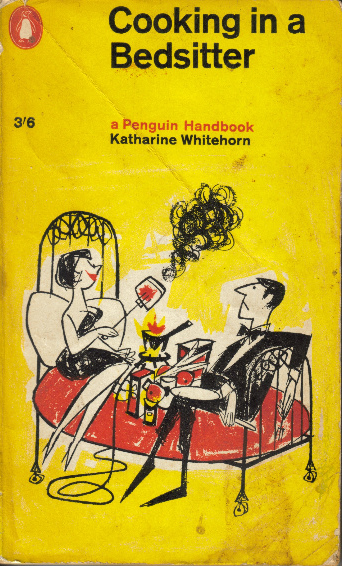 A Penguin logo, reversed out of the photograph is the only other element on the cover. The photograph is the dominant element in the cover hierarchy with the title of the book second, the Penguin logo third and the author’s name the last element. The current edition of the book places the author (now much more well-known) at the top of the cover and higher in the hierarchy of cover elements, it also adds two straplines; one which contextualises the author ('author of Selective Memory'); the other contextualises the book ('The famous book - in print for over 40 years). The book is a standard Penguin paperback, 11 cm by 18 cm with black text on off-white (now very yellowed) uncoated paper. The layout uses a one-column grid with narrow inside and wider outside margins and symmetrical facing pages. Monotype Imprint is used throughout the book. 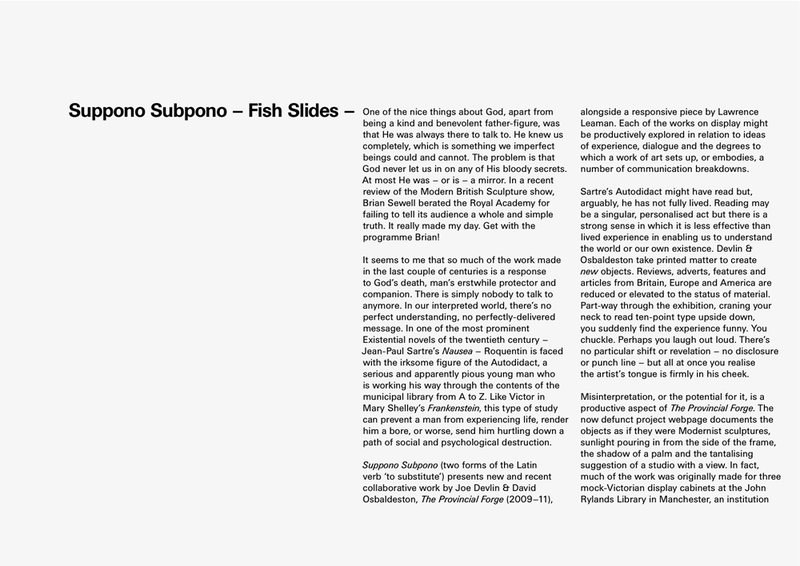 A complex hierarchy, using small caps, normal caps, italics indents and other typographic devices is used throughout to order the various kinds of information in the book. The book is divided into two sections; each section is anounced with a double-page spread with the title of the section set in centred uppercase on the recto. The title of the chapter is centred and set in italic titlecase Imprint with the word ‘chapter’ above, also centred, in small caps with old style figures. Above the chapter title is a line of fleurons which, with the italic titling, creates an informal and ‘jolly’ atmosphere in contrast to the ‘authority’ of the neo-Classical centred typography used elsewhere throughout the book. Recipe titles are also set in italics, ranged left. 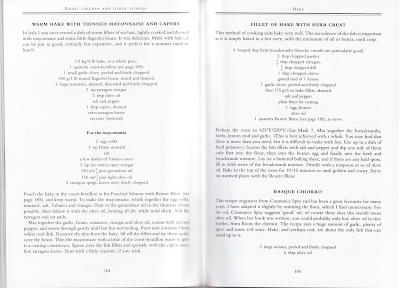 The recipe methods or instructions are, like the bulk of the book, set justified. The lists of ingredients are set in two columns, ranged left at the same size as the instructions. Running heads are centred and set in small caps; pagination is also centred and set in old style non-aligning figures. This is a very easy book to navigate: the well-considered and elegant typography guides the reader through a book that has no colour and no images. The book has a clear contents page at the front, which uses a simple typographic hierarchy to show the contents of the book, breaking it down into the various sections and sub-sections. 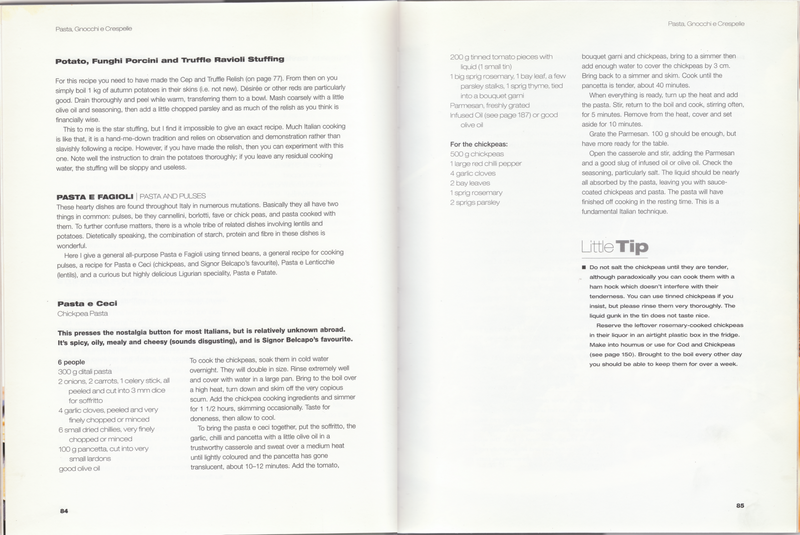 Recipes are easy to find: a quick flick through the book will be rewarded with finding something interesting and inspiring to cook; the designer has emphasised the titles of the recipes using the italic version of Imprint at a larger point size than elsewhere. The writer acknowledges the influence of the food writer Elizabeth David at the start of the book; like Elizabeth David, Whitehorn is a great writer who is entertaining and enlightening to read and, like David’s books, parts of Whitehorn's book are meant for reading as opposed to consulting while cooking. 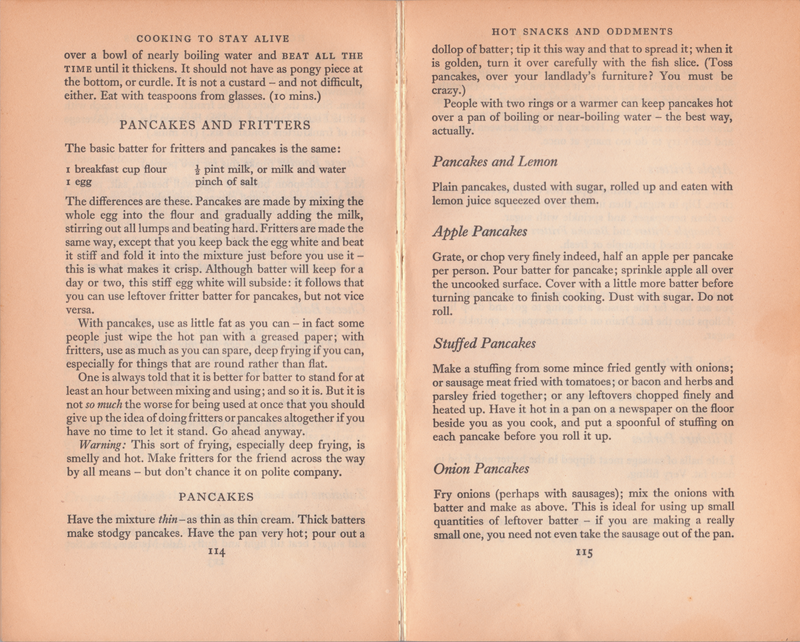 However, one of the strengths of the book lies in the simplicity of the recipes, designed to be made on one or two gas rings, and which have few ingredients and very few instructions; this simplicty of information is amplified by the clarity of the typography which inspires the reader to cook. Early dumplings were probably balls of bread dough taken from the batch used to make bread. However, people soon began to make dumplings from other ingredients, e.g. suet or white bread. 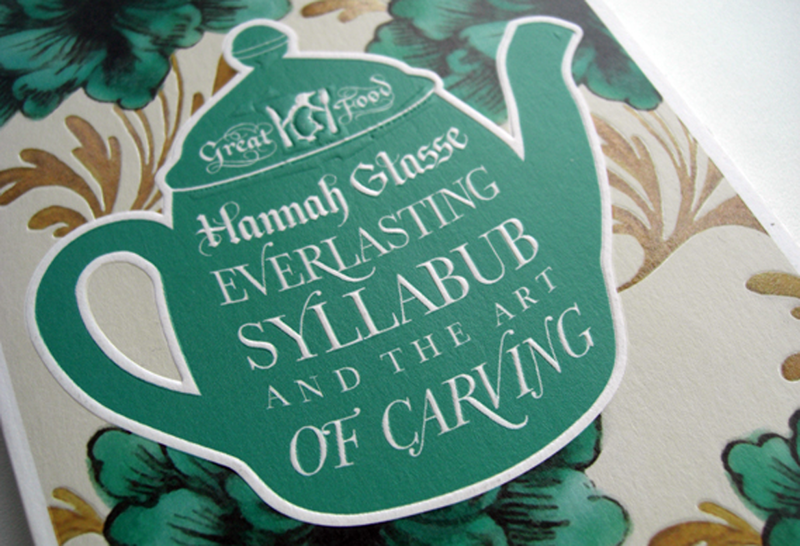 By 1747 Hannah Glasse could give no fewer than eight recipes for dumplings, of which two were for 'hard' dumplings made form plain flour and water, 'vest boiled with a good piece of beef'; two were for apple dumplings; and others were for Norfolk dumplings, yeast dumplings, white bread dumplings, and suet dumplings. When she indicated size, she usually said 'as big as a turkey's egg'. Norfolk is the chief dumpling county of Britain, but the history of its honourable (and plain) dumplings has been obscured by French intervention. the tory told by Dumas in his Grand Dictionnaire de Cuisine that the Duke of Norfolk was fond of his dumplings, and that they were named after him, is wrong, as is the recipe Dumas gives. Indeed, the recipe is so wildly wrong that it looks as though Dumas was the victim of a practical joker when he visited England, possibly the same person who told him that Yermouth (sic), home of bloaters, was in Ireland. 'The farmer's wife very skilfully divided a pond of dough (remember, just ordinary bread dough) into four pieces. These she weighed, and so cleverly had she gauged the size that they weighed approximately 4 oz each. She kneaded, and rolled them in a very little flour until they were quite round, then put them on a plate and slipped them into a large saucepan containing fast-boiling water. The saucepan lid was put back immediately, and then, when the water came to the boil once more, 15 minutes' rapid boiling was allowed for the dumplings. Eliza Acton (1845), apparently referring to Norfolk dumplings, specified several accompaniments; wine sauce, raspberry vinegar, or sweetened melted butter with a little vinegar. Suffolk dumplings, unlike those of Norfolk, are made of flour and water, without yeast. (Eliza Acton recommended adding milk to make a thick batter.) They are steamed or rapidly boiled, so that they rise well. they may be eaten with meat gravy, or with butter or syrup. They often include currants if intended as a sweet dish. Oatmeal dumplings are common in N. Britain, where oats are widely grown. 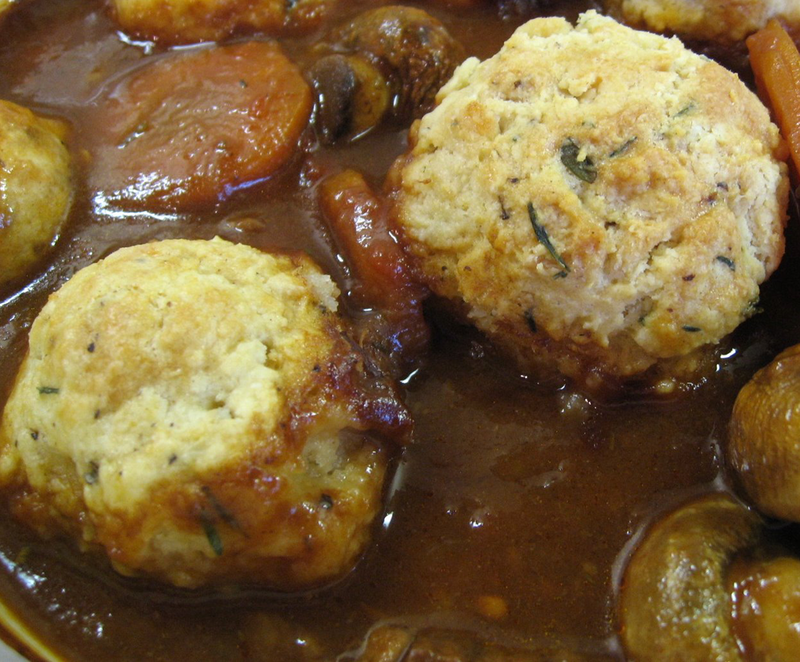 Derbyshire dumplings, relatively small, are made from equal amounts of wheat flour and oatmeal, with beef dripping and onion; to be added to a beef stew half an hour before serving. 'held by Miss Maffin in her small Wharfedale cottage about the 1860s. The round cricket table in the centre of the room, although barely a yard across, had been laid with her best china, a seed cake, bread and butter, ham sandwiches, and a salad of lettuce,cress, radishes and onions. tea cakes regularly replaced the lid of the kettle, to become hot and moist in its steam, while muffins were toasted on a toasting-dog before the fire. At high tea, the means and desires of the household and demands of the occasion can dictate exactly what goes on the table. Cold cuts, meat pies, salads, pickles crumpets, muffins, teacakes, preserves, honey, fruit loaves, cakes and sponges are all considered suitable foods, participant selecting according to tastes and appetite. Tea (Indian) is drunk throughout the meal, although coffee or cocoa may be served if preferred. The origins of high tea are uncertain, but evidence indicates they are different from those of afternoon tea, and that meals of the highest tea type were well established by the mid-19th century. 'High' seems to have been added to the name by people less familiar with it - those from a wealthy urban background, who adopted it as a novelty, or because it was conveniently timed for children, or as a cheaper, less formal alternative to dinner - from which the meal may have actually descended. 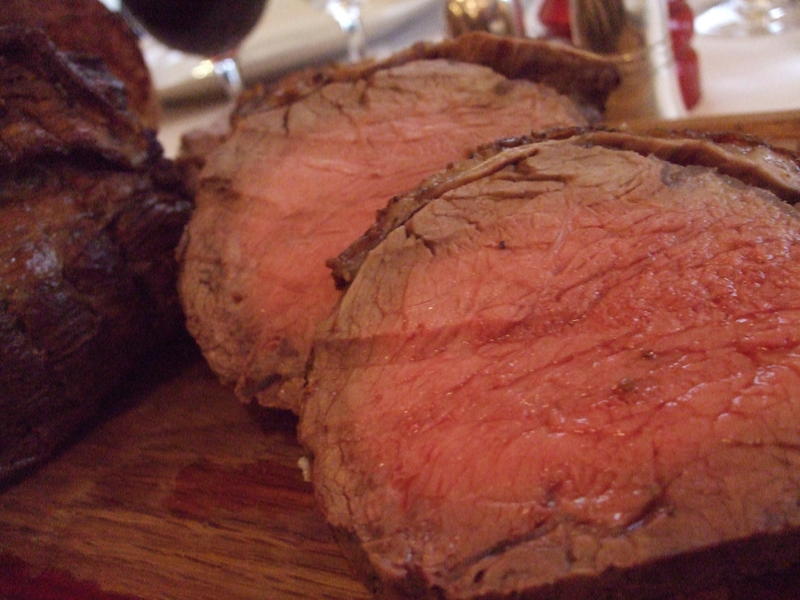 Roasting meat was something at which the British were, indeed are, supposed to excel. An 18th century visitor to England from Sweden, Per Kalm, remarked that 'the English men understand almost better than any other people the art of properly roasting a joint'. Admittedly, he qualified the compliment by observing that the English art of cooking did not extend much beyond roast beef and plum pudding, but still it was a compliment; and the French term rosbifs for Englishmen may also be taken as including at least a touch of affection, although usually derogatory. These are normally fresh types for cooking; they differ from the general run of such sausages in having a significant cereal content. This difference has only been visible since the latter part of the 19th century, when industrial production of sausages began and manufacturers, anxious to have a mass market, sought to keep costs down. The idea of combining met with cereal in a sausage-like casing was by no means a new one. Haggis is an antique and excellent example of the combination. But up to this time English sausages had been like Continental ones in being more or less entirely of meat of some kind. 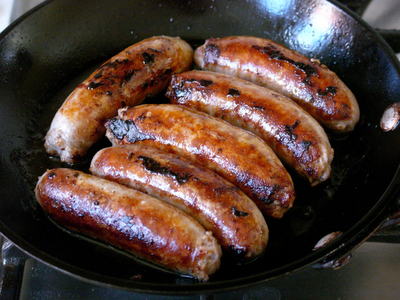 British pure pork sausages, similar to the French or Italian ones, are still made on a small scale, but the great majority of British sausages are made with rusk crumb or special 'sausage meal' (rather than the traditional bread crumbs). the meat content of commercial sausages ranges from below 50% to 95% or more in the most expensive. Pork, or pork and beef, are considered best. Pure beef sausages are cheaper and are preferred in Scotland, where pork has been a less popular meat. tomato, a peculiar local variety which remains popular in the Midlands. It is a normal British pork sausage coloured reddish with tomato purée. 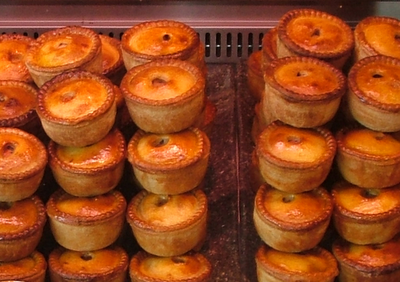 The British pork pie and its relative, the veal and ham pie, are survivals of the medieval tradition of raised pies, and have changed surprisingly little. This particular pie, simply known as ‘pork pie’, is of a form distinct from other pies which merely happen to be made with pork. The filling is of fresh pork without other major ingredients, seasoned with salt, pepper, and a small quantity of herbs, especially sage. At Melton Mowbray in Leicestershire, long famous for its pork pies, anchovy essence was added not only for its flavour but because it was thought to give the meat an attractive pink colour, while pies from other districts were brownish or greyish. In modern pies, which are always pink, the colour is achieved by the use of chemicals. The case is made from a hot water paste of flour, lard, and boiling salted water, well kneaded to give it strength. A small hole is left in the centre of the lid. Traditionally there was a decorative rosette around the hole. Sometimes hinged corsets are used to stop the case of the pie from sagging during baking. Present-day pies are almost always supported, so that they have sheer vertical sides, whereas those of former times used to bulge slightly. The support is removed towards the end of baking to allow the pastry to brown. Once the pie is baked, and while still hot, rich stock made from trimmings is poured through the hole by means of a funnel. When the pie cools the stock sets into a protective jelly. 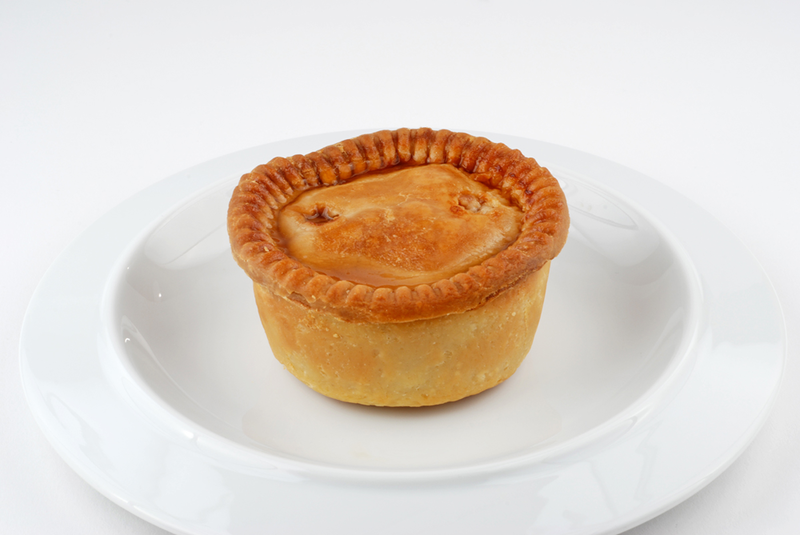 Pork pies are circular when small or medium sized, and are also made as long, rectangular ‘gala pies’ - for a gala or miners’ festival. Large pies used to contain eggs and sometimes pickled walnuts; but now eggs are more usual in veal and ham pies, and walnuts are never used. 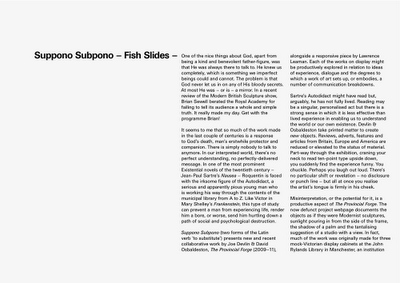 Text by Amy Botfield, commissioned on the occasion of the exhibition Suppono Subpono by David Osbaldeston & Joe Devlin with Lawrence Leaman at E:ventGallery, 23 April – 15 May 2011. The exhibition forms part of the Brief Habits programme curated by Shama Khanna. Morag Myerscough "...notes that what used to define a graphic designer was often a flat, typographic item: 'If you did a poster that's who you were. But it's not the object or the thing, it's the understanding, knowing the nuances of the different shapes and letters and how they read or don't read. The type is the thing and that's a big part of being a graphic designer. That will go on forever'." What's been interesting is, that as the project has grown and I've written about more books then not only does the method that I'm using become more structured (that is, I approach each book in the same way, using the same terms, in more or less the same order) but it also becomes more self-referential. Any image is never seen in isolation but always in relation to others; unlike the first books that I wrote about, the analysis of the more recent books is, inevitably, informed by what I've learned before. Having said that, I do feel that I've been choosing the order of the books that I'm analysing to occasionally 'throw a spanner in the works' to curb a formulaic response - for example, I wrote about Something for the Weekend, a book from a television series that I'd been given as a present, and about which I had no pre-conceived ideas, having not seen the programme. In fact, by looking closely at this book, I learned an awful lot and it was a useful and rewarding exercise. The books I have chosen are largely books that I own so, inevitably, a selection process has already happened. I am not in a position to look at every single cook book that exists and the depth at which I am analysing the titles means that, even if I did have access to all the titles, there simply would not be enough time. I have to remind myself of the aims of this project which was to discover more about how design, and in particular, typography, creates meaning in books using cook books as a case study. At this point it is useful to think about where this research has taken me: I have looked at how brands (in the forms of authors such as Jamie Oliver) are established through the design of cook books; how the design of cook books changes as an author becomes established; how successful design formulas are used and repeated by publishers; and how cook books are now big business, their success reflected in the high production values given to them. I have been particularly interested in the paradox of massive sales of both cook books and of ready meals which I think shows how cook books are now about aspiration - they are designed for looking not cooking. I recently went to 'Books for Cooks', a bookshop in Portobello that specialises in cook books. The shop is crammed full of cook books, arranged by types of cooking; types of food; countries etc. Seeing so many books because made me realise the limitations of my project - and, perhaps, my methodology. My decision to buy a cook books is usually based on functionality (Will I use this book?) but also on visual appeal (Is it well designed?) - as I said before, my selection has already been edited, based on my taste. I am not sure this is such a bad thing? It may not be scientific but it does mean that I am enthusiastic about what I read about - and know the subject well, having used them for reading and cooking. I was asked to design a logo for the Amateurist Network, a collective that exists 'somewhere between a support system and a learning network.' I was thinking about the idea of the amateur in design: I used the typeface Arial, a default system typeface that is considered by many professional designers to be a poor imitation of Helvetica, and based the logo's shape on A4 paper proportions, a reference to desktop publishing. Despite the Amateurist Network's collective roots, they were keen to explore a branding and identity that could be perceived as corporate (although my early versions were rejected for being too close to the logo of American Apparel). 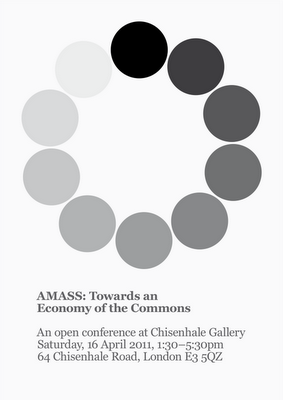 I enjoy the tension generated by the skewed corporate Modernist logo and the egalitarian aims of the collective though, on reflection, the collective's aims and the utopian ideals of Modernism are not that far apart. 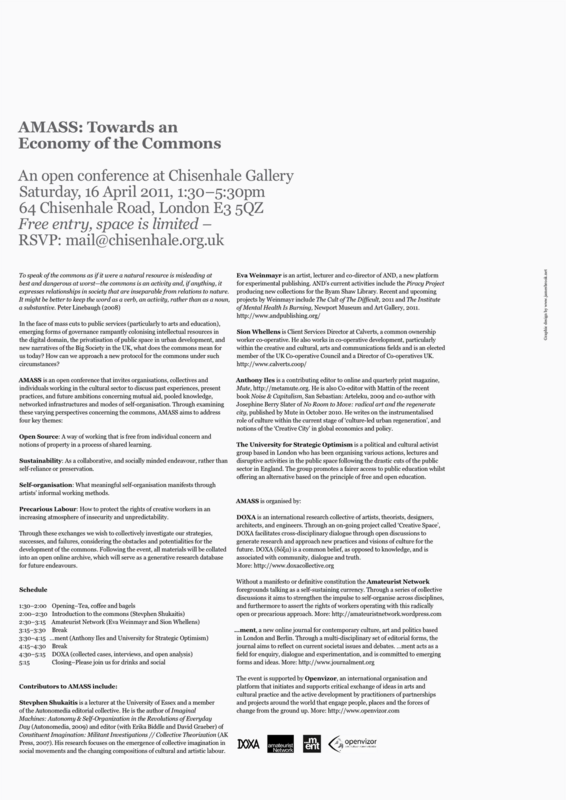 An A3 single colour poster I designed for an open conference at Chisenhale Gallery. This book is written by Simon Hopkinson, ‘one of Britain’s top chefs’ and a respected food writer. The design is simple, uncluttered and, on the whole, helps the reader navigate the contents. The design of the book and its relative small size, which is closer to a reference book than a cookery book, establishes the idea that this is a serious book: the over-riding effect is of understated authority generated by the use of Garamond in a formal manner. 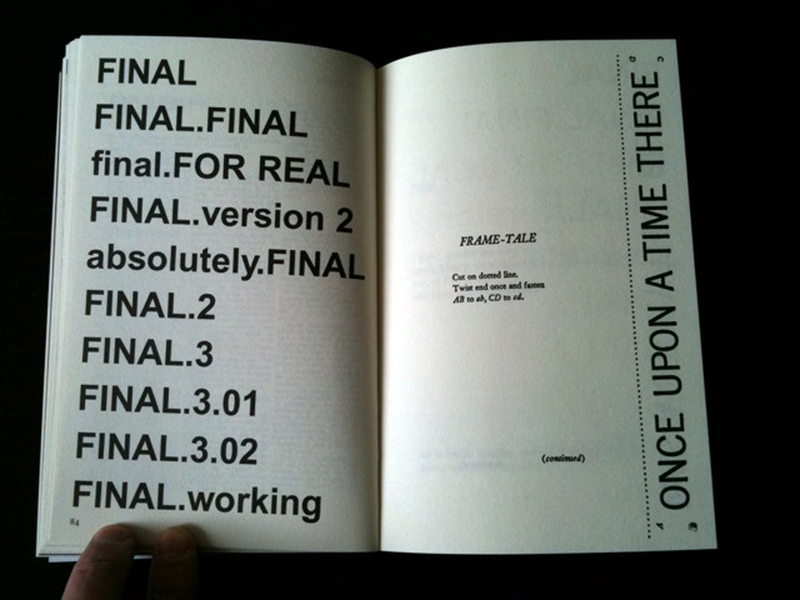 Running parallel, and in contrast, to the authority of the reference book is the idea of the book as an anthology of stories, established by the title of the book and amplified by the cover design which, with its illustration of a lemon, has more in common with the cover of a novel than a cook book. 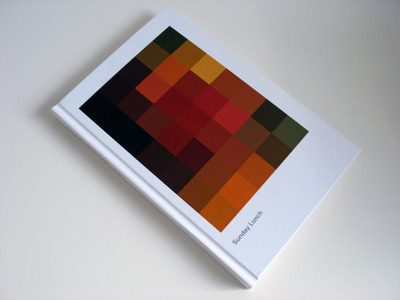 I would argue that the design of this book suggests it can be read in two ways: the reader can choose to consult the book as a reference book, using the contents page or the index to navigate the content or, with its continuous text, it can be read as an anthology of stories, of recollections about food. It is this tension between the two functions of the book, amplified by the design, that make it such an interesting read. 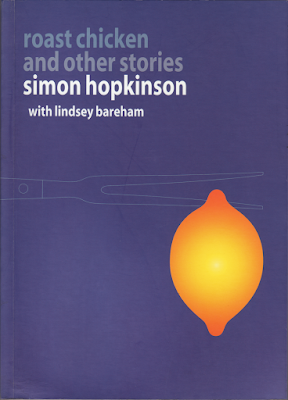 The cover is a solid vibrant blue with a dominant element of a simple illustration of a brightly-coloured lemon that contrasts against the blue; an outline illustration, barely noticeable on first glance, of a carving fork adds another level of detail to the cover. The title of the book and the author is set in lowercase sans-serif typeface, possibly Corbel, and is ranged left in the upper left-hand corner. 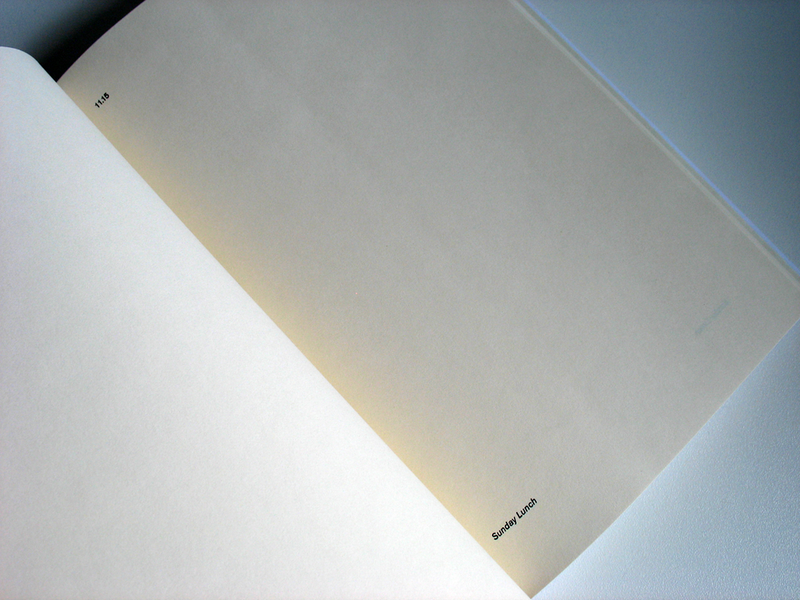 The title of the book and the subtitle are the second most dominant element in the cover hierarchy, they are printed in two lighter blues with the author’s name in white. The cover is simple but perfectly balanced. 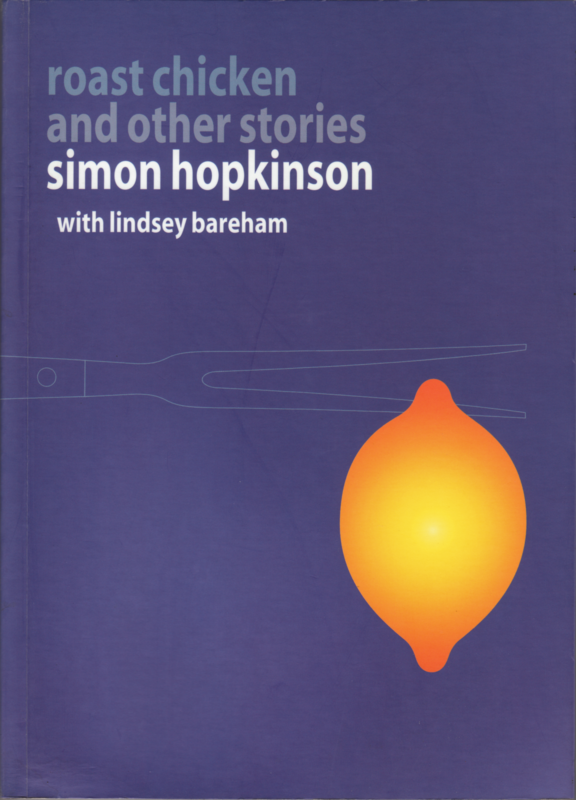 The lack of information and the tension between the title of the book and the seemingly non-related illustration of the lemon creates an intrigue which invites the reader to find out more. 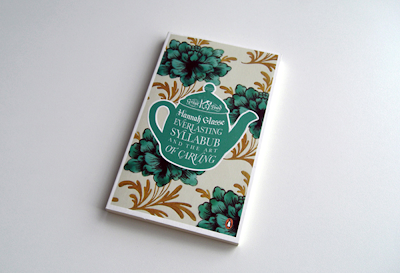 The cover acts as a taster for the ‘stories’ contained within; the format of the book, which is under sized for a cookery book, adds to the conceit that this is a story book, looking more like a novel than a cookery book. 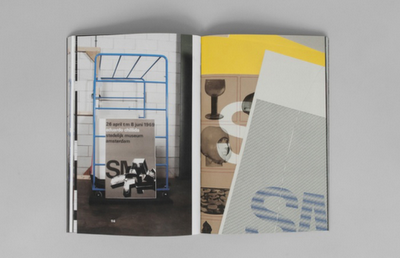 The book is 15 cm by 21 cm with black text and some full colour illustrations printed on white coated paper. 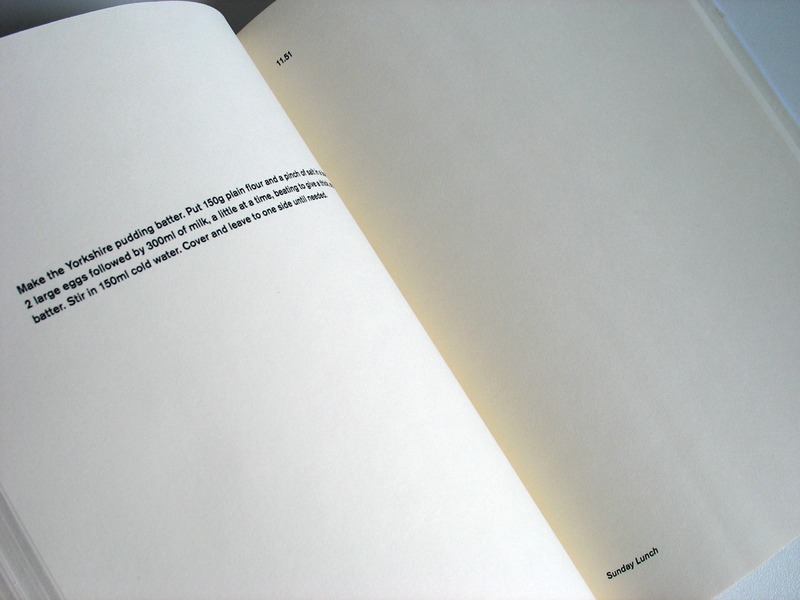 The layout is based on a one-column grid with narrow inside and outside margins and symmetrical facing pages. Garamond is used throughout the book: centred titlecase bold Garamond is used for recipe titles; regular Garamond for the justified body text with bold sentence case Garamond for emphasis. Running heads are centred, set in small caps Garamond with a decorative rule beneath; pagination is centred and appears at the foot of the page. The book is divided into sections, each dealing with a type of food, that open with a double (or occasionally single) page spread; watercolour illustrations are used on these pages to add interest and the opening pages are demarcated from the main pages by having no running heads or decorative rules. The recipes themselves are set in the same style as the ‘stories’ that precede them and are separated by the list of ingredients. The idiosyncratic watercolour illustrations are scattered throughout the book, acting as a foil to the formality of the typography; they usually show, in a fairly representational manner, the ingredients being discussed. Section openings are announced with a larger illustration, contained in a square; these tend to be excursions into whimsy - a hake swimming in a scarf or the Eiffel tower topped with a head of garlic for example. The recipes themselves are not illustrated and I would suggest that this places the book in a lineage of books by respected food writers such as Elizabeth David and Richard Olney that have few or no illustrations. The subliminal message is that this is not a book for looking at - for idly flicking through, it is a book by a serious writer that is intended to be read. This is not an easy book to follow whilst cooking: the type is quite small and the line length a little too long; it feels like a book which is intended for reading and not for consulting whilst cooking. The lists of ingredients are centred on the page; this works surprisingly well with the majority of ingredients being only three or four words - where the ingredient is longer, taking up the width of the page, the result is not pleasing and line breaks might have helped the reader. There is a contents page at the front of the book which, through a controlled and simple typographical hierarchy, shows the contents of the book, breaking it down into the various sections which are shown in bold uppercase Garamond with the recipes in each section presented underneath in regular Garamond. The contents page clearly explains the structure of the book: ingredients (anchovy, asparagus, aubergine etc) arranged alphabetically with recipes focussing on each of the ingredients underneath. I feel it is worth highlighting the contents page of this book as it functions so successfully. It is clear, that when contents pages function well, they help the reader to understand and navigate, from the very start, the various parts of the book, offering a key to the structure. 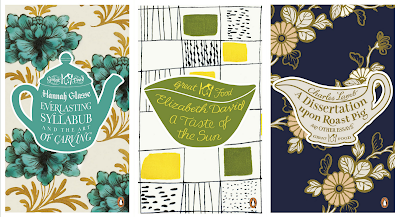 Penguin have just published a new series of books focussing on Great Food with 20 examples of the 'finest food writing from the last 400 years'. 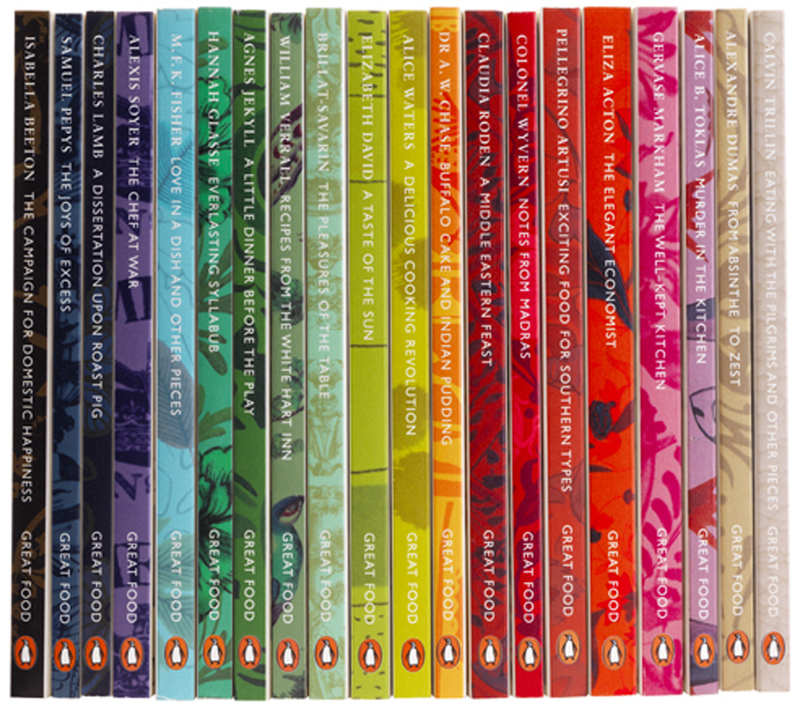 Like other Penguin series such as Great Ideas, Great Loves and English Journeys, these books are small paperbacks, containing sometimes edited essays often extracted from more substantial books. Like the Great Ideas series, designed by David Pearson, the covers feature embossed lettering and spot varnishes to pick out the details of the illustrations. 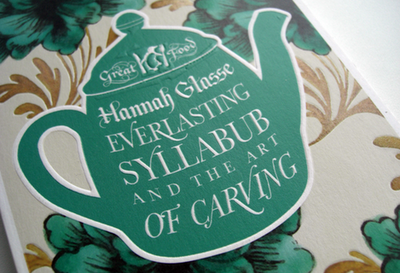 Unlike the Great Ideas series, which are typographically-based and printed in two colours, the Great Food series is far more lavish - with backgrounds based on ceramic designs relevant to the period of writing and with simple illustrations of crockery and culinary utensils that place the books firmly in the domestic sphere. 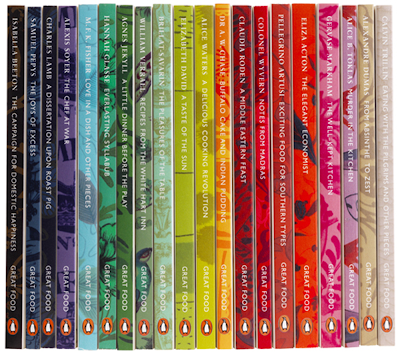 The spines of the books are printed in a rainbow of colours which would look great on a bookshelf - and appeal to the collector. A further charming detail is the Penguin logo complete with knife and fork. I'm intrigued to see what the interiors of the books are like - I'll look out for them when I visit the London Book Fair next week. Wim Crouwel: A Graphic Odyssey - Catalogue (Unit 04) published by Unit Editions to accompany the major retrospective at the Design Museum and available in three different cover photographs with a variety of title stickers. 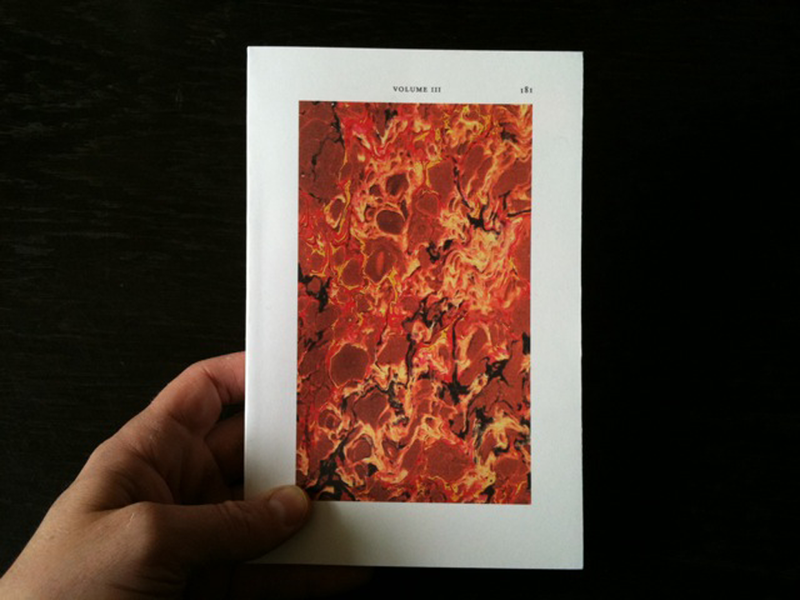 At the weekend, I bought a copy of Louis Lüthi's On the Self-Reflexive Page at the Pa/per View book fair in Brussels. 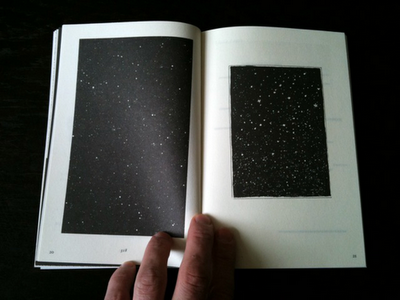 The subject of this modest paperback book, printed in black, is the page. All the pages in it are reproduced from other books, mainly taken from literature but also from art books that refer to literature. 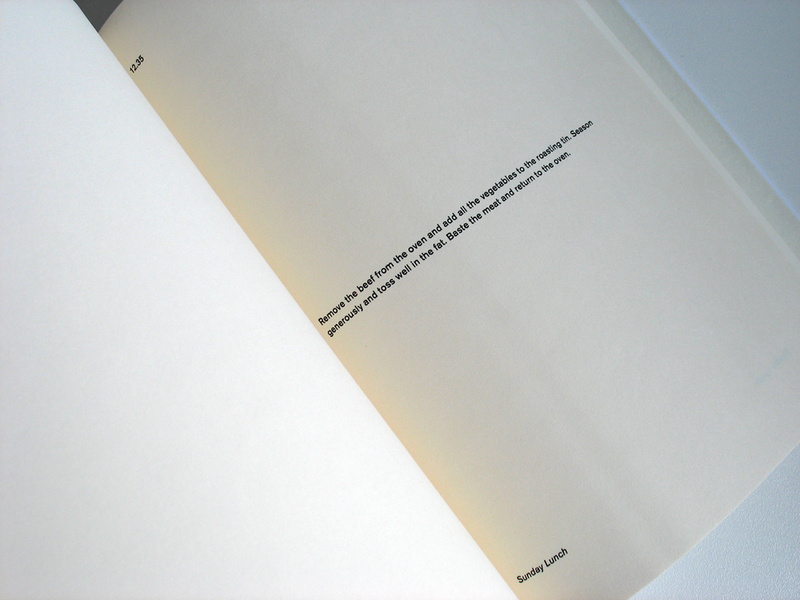 The extracts are arranged thematically, creating a typology of self-reflexive pages. Themes include Black Pages, Blank Pages, Drawing Pages, Photography Pages, Text Pages, Number Pages and Punctuation Pages. A list of the original sources appears in the back of the book. This is the second version of the Sunday Lunch book. In this 'extended remix' hardback version, the temporal space has been stretched out over 200 pages with each page representing one minute. 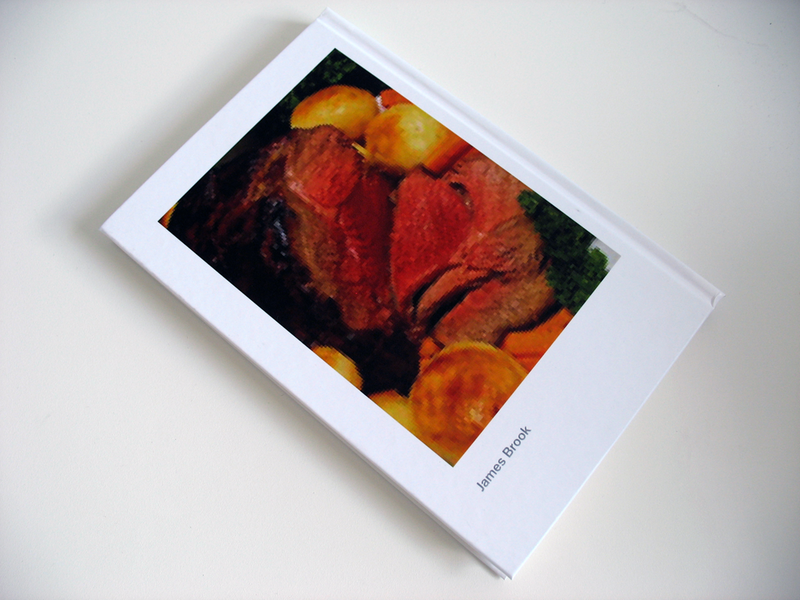 The pixelated image of the Sunday lunch appears on the front cover with the higher resolution image on the back cover. 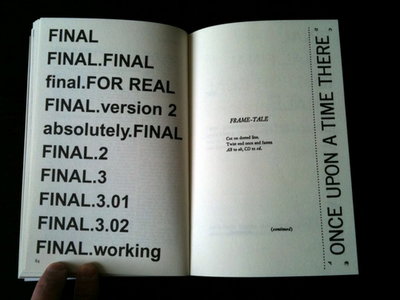 There are two timelines within the book: the linear progression of the book, grounded in left to right reading, that represents the three and a quarter hours that it takes to make a Sunday lunch; and the method or instructions which is based on the conventional top to bottom reading of the page in the West. The book is 2cm thick which makes it feel fairly substantial unlike the previous pamphlet-like versions. I like the fact that the book has a physical presence: I was attempting to show the temporal space of the recipe, of something that had substance and I think the width and weight of the book illustrates this. In terms of a practical application, I'm not sure the book succeeds - although it demystifies the cooking process with precise timings and instructions, the form is not totally practical and in many ways has become a book for looking rather than cooking which was my original critique of contemporary recipe books. Blurb, who printed the book, have just announced new, grey endpapers - I think these would make the book a bit smarter, linking the grey type on the cover. I might live with the book for a while and then consider printing a revised version.